Bloom! 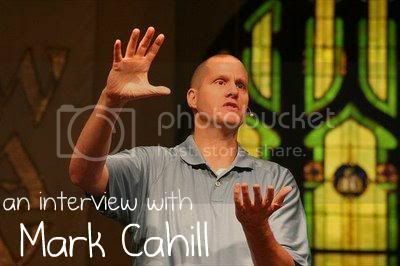 recently had the privilege of talking with author and speaker Mark Cahill. The Lord has given him a heart for the Gospel and sharing it with others. By speaking and writing his two books, He desires to encourage believers to be bold in their faith. A note from Joanna: While on my three and a half month mission trip in Texas, I had the privilege of hearing Mark Cahill speak twice on sharing the Gospel. Over the years, I've been around the world to do just that, so I was familiar with his topic. One day after hearing him speak, I was with a friend who doesn’t know Jesus. As I was sitting next to her, I found my flesh making excuses for why I didn’t have to witness to this friend. The enemy chimed in, too, “Oh, you’re tired. Just take it easy. After all, you’re still recovering from severe allergy reactions and a concussion. Just smile and don’t say anything.” At that moment, the Lord brought to mind something I had realized from Mark Cahill’s talks – as a follower of Jesus Christ, I have no excuse - I simply must witness because I’m commanded by God! I'm thankful to say that I didn’t listen to my flesh and the enemy’s tactics and instead went ahead and shared my faith with my friend. As it turns out, I wasn’t too tired or weak to share. It was a beautiful time. Another seed was planted in my friend’s heart, all because Mark Cahill was faithful in sharing, and the Lord brought it to mind at the right time. And now, listen in our on conversation and be prepared to be inspired to share your faith! Mark, you used to play basketball and then majored in business at Auburn University. How did you go from basketball and business to speaker, writer and passionate sharer of the Gospel? Well, the good news is, I kept getting fired and I kept losing all these jobs. It seemed like God was angling everything my way. I finally got a job teaching school and then got fired again. I didn’t get fired for anything bad any of the times, God just took me out of it each time. I actually had a year where I couldn’t find a job, so I just hit the streets for that year – went to malls and beaches and parks and music festivals, just started witnessing. It was kind of like starting to “cut my teeth”. Then a friend asked me, “Hey, what do you do for a living?” and I said, “I don’t know, maybe I could speak.” We put a resume together and then I started speaking all over the country. One of my former students said later, “Mr. Cahill, you’re still teaching - your classroom is just a whole lot bigger now!” That’s how it all got started. Tell us a bit about your books and why you wrote them. I’m actually not much of a writer. I had two different men of God actually “threaten” me to write a book. They said that I had way too much good teaching and way too many good stories - that I needed to put all of that teaching and stories together in book format so that I could leave it with people. Funny thing is, the editor of my first book, One Thing You Can’t Do in Heaven, said the title was way too long. I just knew it was the right title. She took it to some printers to get some feedback from them and they said, “Now wait a minute, what’s the one thing you can’t do in heaven?” The editor came back to me and said it was a perfect title after all! It’s really a book geared at Christians, to be bold in sharing their faith. Then someone asked me if I would write a book for the lost people, since I had written One Thing You Can’t Do in Heaven for the saved. So that’s where One Heartbeat Away came from – it’s geared towards people who don’t yet know Jesus, although many believers find this book very helpful because of all the apologetics and how to defend your faith. I wrote this one and then I realized I’d written books for all the people of the world – a book for believers (One Thing You Can’t Do in Heaven) and a book for the lost (One Heartbeat Away). Why is it so important that we, as believers of Jesus Christ, share our faith? One, it’s commanded by God. It’s not an optional part of Christianity. A lot of people want it to be an optional thing, but God said, “Go ye therefore and teach all nations…” (Matthew 28:19-20, KJV). When God commands something, there’s a reason behind it. When He says to not sleep around before you get married, there’s a reason for that. A lot of people don’t understand this. When God says something, He doesn’t tell us a billion things to do in the Bible. He keeps it kind of simple, actually. Once we realize God is real, Jesus is real, hell is real, then we won’t want anyone to go to hell. God says in Ezekiel 33 that no one else can take the punishment for the wicked. That means that Mark can’t take someone else’s punishment, you can’t take someone else’s either. That also means if I don’t witness, if I don’t share my faith, I’m pretty much saying “I take pleasure in the death of the wicked.” I mean, there’s not many ways you can read that! Another thing, it’s also a joy to share! I looked at my emails this morning and I found one from a waiter in Chicago. 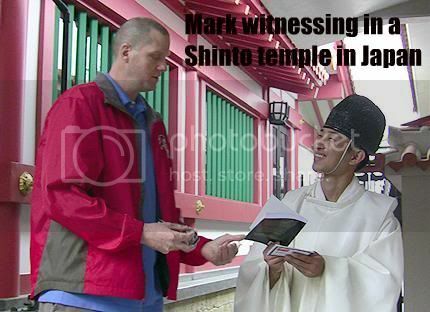 He is a Jehovah’s Witness. I shared with him and gave him one of my books and he said he’d be in touch. Two days later and he’s back in touch. Don’t make the assumption that people aren’t going to talk to you about God. I make the assumption that you do want to talk to me about God, because they live in the same world as we do. They see the one year anniversary of the tsunami in Japan, the earthquakes, the economy not going well. They wonder what’s up. We know what’s up. We know the time for Jesus Christ to return is getting closer. It’s actually a great, great time to bring up your faith with others. Remember, it’s not a presentation, it’s a conversation. People love a good conversation, so let’s converse and plant those seeds. What are some practical ways that we can use every day to share Jesus with others? There’s a whole chapter in One Thing You Can’t Do in Heaven about questions and ways to start a conversation. Once you have a few questions, it’s much easier to get rolling. Also, use t-shirts, necklaces, jewelry (on yourself and on others) to strike up a conversation. For example, a few days ago I noticed that Ryan, a guy in a restaurant, had on a Livestrong bracelet. I found out that one of his relatives has stage 4 cancer. Bingo, we got into a conversation. We talked and talked. He was so thankful. So be on the lookout for symbols on jewelry and t-shirts that would be a great way to make an easy transition into conversation. Another thing I do is I ask someone, “Hey, can I ask you an interesting question?” They say sure, because people like interesting conversations. Then I might say, “Do you ever think about what will happen when you die?” They'll reply and then we continue talking. It usually leads to a fun conversation. My book One Thing You Can’t Do in Heaven helps lead you in those kind of conversations, so be sure to check it out. What do you recommend to help us as we witness? ~ my books One Thing You Can’t Do in Heaven and One Heartbeat Away. You can get them by going to my website. I also have a lot of great resources, there including tracts, DVDs, and more. We don’t sell things – it’s donation only, to aid you however we can. ~ practice, practice, practice! Anything you’re good at – kicking a soccer ball, shooting free throws, multiplication tables, calculus – it’s just practice. It’s doing something over and over again. Then it becomes second nature to you. A few weeks ago, I was having dinner with some people and the doctor there said that it seemed so natural for me to witness to others. Well, once you do something enough it becomes second nature to you. Wouldn’t we want to get to the point where we see that person in the store and we think, “Hey, I’ll go give that person a Gospel tract.”? I was in the Milwaukee airport and a guy walked up to me. He said, “I saw you in the Atlanta Airport” – I recognized him because we had been on the same flight. He stated, “I knew what you were doing.” I asked, “What was I doing?” He answered that he knew I was walking around looking for someone to witness to. I told him that was true. Turns out, he was another Christian and he saw me and thought, “Hey, that guy’s going around witnessing.” That should be true of us – that we’re just not Christians going to a sporting event or walking around the mall, but that we’re actually sharing our faith as we’re there. ~ realize that it’s not a presentation, but a conversation. When a lot of people realize you don’t have to go on the street corner witnessing, but just have a conversation, it takes the pressure off. Conversations people can handle – they do it daily. ~ the hardest person of the day to witness to is the first person. For me, when I’m in an airport or a mall, once I get the first one done, it’s much easier. Pretty soon you’ll be chasing them down the hall! It’s exciting and fun. ~ obedience always brings joy. When you obey your parents, there’s joy in that. When you disobey your parents, you know there’s not joy. Same thing – when you obey God, you get a joy from obeying Him. It’s not obeying Mark or anyone, but God. ~ you don’t have to be a perfect witness, but a faithful witness. Scripture says “Well done my good and faithful servant” in Matthew 25:23. Yesterday at the Chicago airport I wasn’t looking for a perfect conversation, but a faithful conversation. That takes the pressure off people. Don’t think “Oh, I didn’t say that, I messed up there.” Instead think, was I a faithful witness? Look at Hebrews 11 – God uses faithful people, not perfect people. For more information and to get Mark's books and resources, check out his website!